Submitted by Jerry Leggett, Executive Director, Dayton International Peace Museum. The opening reception for the artist will be held at on Friday, July 15 from 4 p.m. to 7 p.m., at the Dayton International Peace Museum, 208 W. Monument Ave.
For questions, photos and interviews, contact Jerry Leggett at (937) 999H7314, or jerryleggett@gmail.com. DAYTON — The Dayton Peace Museum is pleased to present a powerful new exhibit, “Borders”, by Yellow Springs artist Beth Holyoke. 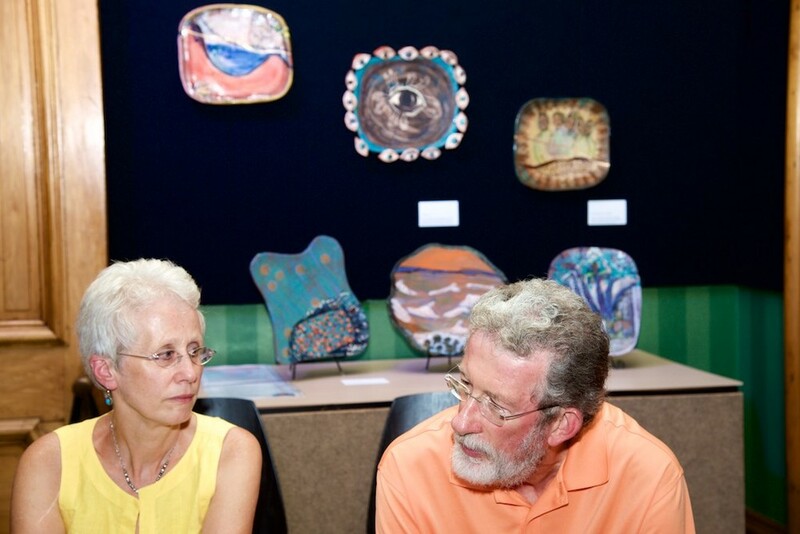 Moved by the suffering of people fleeing from the chaos of war, Holyoke has created a series of over 20 plates and plaques depicting families searching for a refuge and their yearning for a safe haven. The opening reception for the artist will be held at on Friday, July 15 from 4 p.m. to 7 p.m., at the Dayton International Peace Museum, 208 W. Monument Ave. Holyoke will talk about her motivation and technique. Beth Holyoke has been a skilled ceramist for over fifteen years. Shows of her drawings, hand papermaking, and works in clay have been held at the Dayton Visual Arts Center, Yellow Springs Arts Council and Earlham College. “Borders” will be displayed at The Dayton International Peace Museum during the months of July and August. There are two other events planned around this exhibit. On Sunday, July 31, at 3 p.m., Dr. Ibrahim Ahmad and his family will present a program of music and song at the Dayton Woman’s Club with refreshments following at the Dayton International Peace Museum. On Sunday, August 14th at 3 p.m., Melissa Bertolo of Welcome Dayton will report on their success in helping new arrivals feel at home in our city. For more information on “Borders” or to volunteer as a community partner, please contact Jerry Leggett, Executive Director of the Dayotn International Peace Museum, at (937) 999-7314.